SIX PLUS ONE. An artist paints six women's stories as one organic whole. As the seven stories blend with each brush stroke — the whole becomes greater than the individual parts. "Women must see themselves with new eyes." Women Are Human provides a powerful perspective to see women as human beings with human rights, able to exist and live in their own right -- with 'new eyes' to envision a world free from the normalization of violence against women and girls. WH is a grassroots movement that is organized by volunteers committed to the Peace Literacy Foundation's mission to offer experiential peace education and cultural healing through the arts. 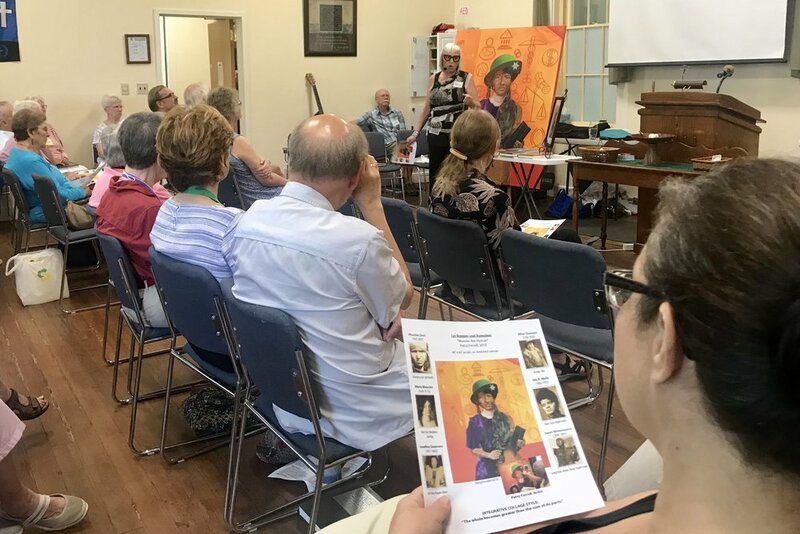 WH creates fine art, educational presentations and practical resources appropriate for a variety of settings such as public libraries, YWCA's, schools and community organizations. WH is the brainchild of painter and retired trauma therapist Patsy Ferrell. Her painting, Les femmes sont humaines (first in a series) serves as an avatar for its work. 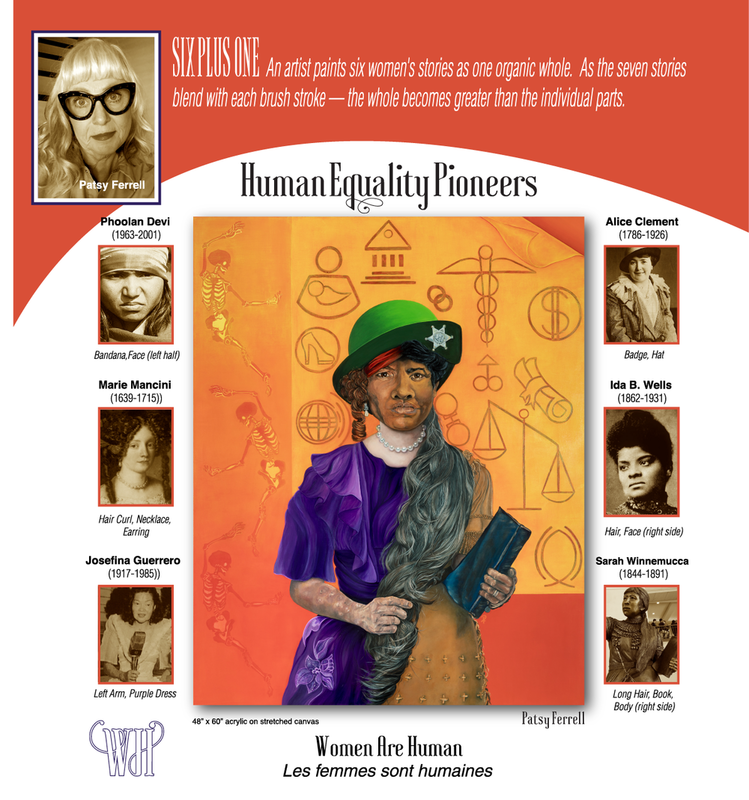 Ferrell's signature Integrative Collage (IC) painting style embeds the narratives of six women in history she brings to life through her brush. A bold color palette breaks through the barrier of invisibility often experienced by women in male-dominated institutions and culture. Powerful story-telling through original art. Engaging presentations. Innovative educational resources. WH Educational Panel Exhibit for libraries, schools and community settings. WH free/low cost presentations for organizations with limited budgets. In 2019, WH is establishing a program to exhibit museum-quality reproductions of Les femmes sont humaines and traveling panel exhibits in public libraries and other educational settings. During the month of September, 2019, WH Traveling Exhibits are scheduled at the Dayton Metro Library and several of its branches. Book Discussion Groups will engage the stories of the women featured in the painting. WH is ready to come to your community with a presentation or to help organize an exhibit. Complete the contact form online to get more info or email us at: peaceliteracyfoundation@gmail.org.